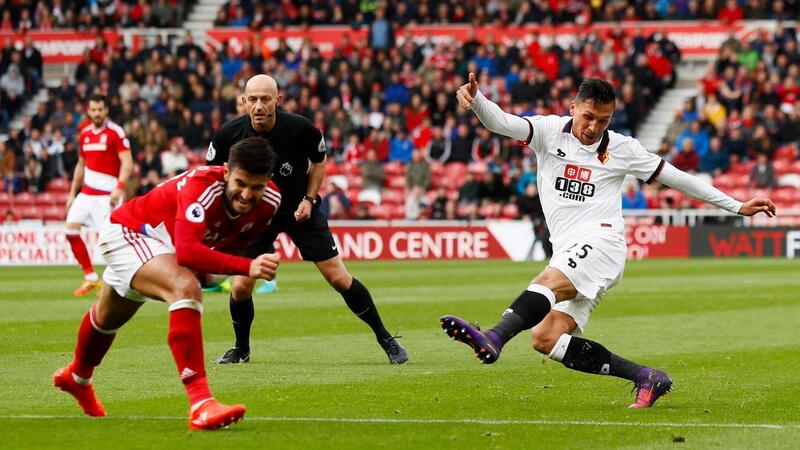 The winning goal and a clean sheet handed Jose Holebas (£4.5m) a Fantasy Premier LeagueBonus Points System (BPS) score of 46 for a maximum three additional points as Watford claimed victory over Middlesbrough. George Friend's (£4.5m) BPS score of 31 was enough to claim him two bonus points. The Middlesbrough left-back turned in a strong all-round display. He produced eight clearances, blocks and interceptions (CBI), five successful tackles and eight recoveries, in addition to completing 90% of 33 attempted passes. Hornets goalkeeper Heurelho Gomes (£4.9), with a clean sheet and three saves, took a single bonus point thanks to a BPS tally of 28. In a match lacking many clear-cut chances, Boro striker Alvaro Negredo (£6.5m) scored 8.6 to top the ICT Index. Returning up front to lead the line at the expense of Jordan Rhodes (£5.5m), the Spaniard's Threat tally of 44 gave him the edge, with two goal attempts, both from inside the area, and seven penalty-box touches. Negredo also created two chances and registered more successful passes in the final third (10) than any player on show at the Riverside Stadium. Match-winner Holebas was just behind on 8.4, while Friend took third with an ICT score of 6.6 having created two chances and provided five crosses. Holebas's 15-point haul has earned him nearly 12,000 new Fantasy Premier League owners in the Gameweek, second only to Arsenal's Laurent Koscielny (£6.2m) for defenders. The former Greece international has supplied a goal, an assist and five bonus points in the last two rounds of fixtures, which coincides with Watford's move away from a 3-5-2 formation. If the Hornets can maintain their new found defensive stability – this was their first clean sheet of the season – Holebas’ 2.1% ownership will increase further. The popular Etienne Capoue (£5.3m) has managed only a single attempt over the last two Gameweeks since the tactical switch. Sitting in 43% of FPL squads he has now failed to earn points in his last three appearances and is set to suffer a decline in ownership for the first time this season. Having trialled a 4-3-3 against AFC Bournemouth in Gameweek 7, Walter Mazzarri opted for a 5-4-1 set-up on Teesside with Odion Ighalo (£7.3m) dropped to the bench for the first time this term on the back of one goal and an assist from seven starts. The Hornets now have four favourable opponents in the next six Gameweeks, according to the Fixture Difficulty Ranking (FDR). Next up, Mazzarri's men travel to Swansea City and host Hull City, with matches against Stoke City and West Bromwich Albion also on their short-term agenda. Middlesbrough, meanwhile, have taken only one point from their last five matches and have scored more than a single goal in a match only once all season. With trips to Arsenal and Manchester City in the next three rounds of fixtures, Negredo has been subject to 16,000 transfers out in the Gameweek. The 17.3%-owned asset has not scored since the opening day of the season and has done little of note since providing two assists in Gameweek 2.